2 telephones was created as part of a sonification project for the Main Street Museum of Art in Hartford, Vermont. 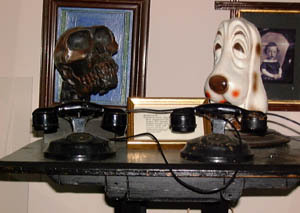 Two antique toy telephones were modified to play CDs when the handset is lifted. 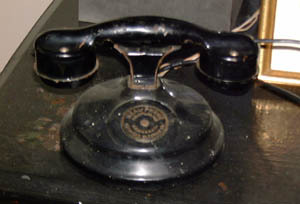 The stated purpose of the phones is to provide information to museum patrons about some of the many fine exhibits in the museum's permanent collection. However, the exact relationship of the sounds heard on the phones to the exhibits they accompany is often unclear. It may, in fact, be unknown.